1950: 190 individuals in the U.S. are dismissed from government employment for their sexual orientation, commencing the Lavender Scare. The fear and persecution of homosexuals in the 1950s paralleled the anti-communist scare campaigns of McCarthyism. LGBT people were fired from US government jobs in the 1950s because supposedly the “Reds” (communists) could blackmail them into becoming spies. 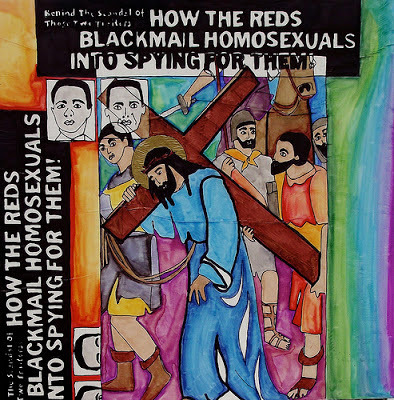 Jesus continues carrying his cross through another scene in the history of persecution faced by LGBT people. I love the colors of this image, like a rainbow flag in the background.